UAV: what to do if they are hostile? 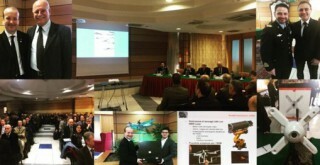 Organized by the Centro Studi Militari Aeronautici (CESMA) a conference entitled “UAV: what to do if they are hostile?” has been held to discuss how it is possible to counter the potential threat created by the increasingly and rapid development of unmanned aerial systems, when potentially used by hostile actors. Due to their characteristics, in fact, such miniaturization technology readily available and therefore scarcely traceable, the absence of a crew, the UAV are suitable for use as a possible weapon systems, well within reach of individuals or even criminal organizations. So what are the chances to defend against this new threat? The speakers examined the issue from different points of view, to answer this question by analyzing the current situation and possible future developments. The conference was moderated by the Air Force General (r) Giuseppe Marani and the director of CESMA, Inspector General (r) Nazzareno Cardinali, and saw the authoritative intervention of representatives of all the organizations involved in the SAPR world, such as the Air Force , Public Security, the General Secretariat of Defence, the Civil Aviation Authority and the main industries in the sector. 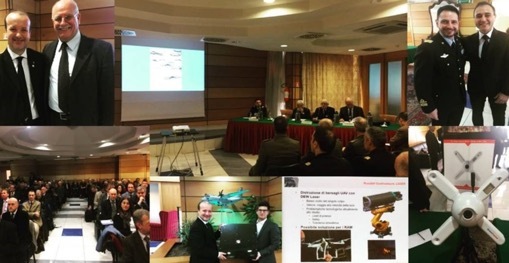 The opening work the intervention of the Head of the 3rd Department “Planning Instrument Aerospace” of the Air Staff, Brigadier General Luigi Del Bene. He explained the current state of UAV the use by the Air Force, including how they represent an essential part of the present and the future of the Armed Forces, especially for their essential role in creating the so-called “information cloud” and the “information superiority”. The General, in the picture at the top right with the Ten. Col. Felice D’Ippolito, then analysed the asymmetric threat posed by UAV, especially those of small size and low cost, specifying how the possible hostile use of such structures, as kinetic and non-kinetic instruments, it has always been considered by the air in the plans of defence of national airspace. Very interesting presentation made by Col. Slaughterhouse Valendino of ARMAERO on anti-UAV systems. I will know they have low IR and low emissions “radar cross section”, have automatic guidance with the possibility of a flight plan programmed, it is also very easy to edit them with high-tech components. Among the technologies used for the abatement of UAV there are lasers, bazookas compressed-air networks and rifles to electromagnetic pulses. In these cases, the drone little ‘to inflict damage with the fall not to mention the fact that the laser makes incandescent the parties affected by the beam. RF solutions exist to break the link with the control station that are ineffective, however, if the drone automatically continues its flight plan. Workarounds may be the use of drones’ interceptors individual or swarming. During the event Dr. Samuele Martelli, Italian Institute of Technology unveiled DualCam for the detection and localization of drones, an innovative device inspired by the world of nature, transformed into images the soundscape of the scene. DualCam is the first optical-acoustic camera that detects, locates, classifies and reporting abnormal events such as the presence of a drone in the scene in real time and day and night, even in adverse climatic and environmental conditions in which the conventional video surveillance cameras fail resoundingly. DualCam, the result of research conducted by a team of researchers from the PAVIS department at the Italian Institute of Technology in Genoa, is able to generate a stream of optical and acoustic images superimposed. acoustic image is a 2D map of the scene, in which each pixel encodes the intensity of the sound coming from one direction and emitted by any source, whether it is made up of people, vehicles, or generic items.